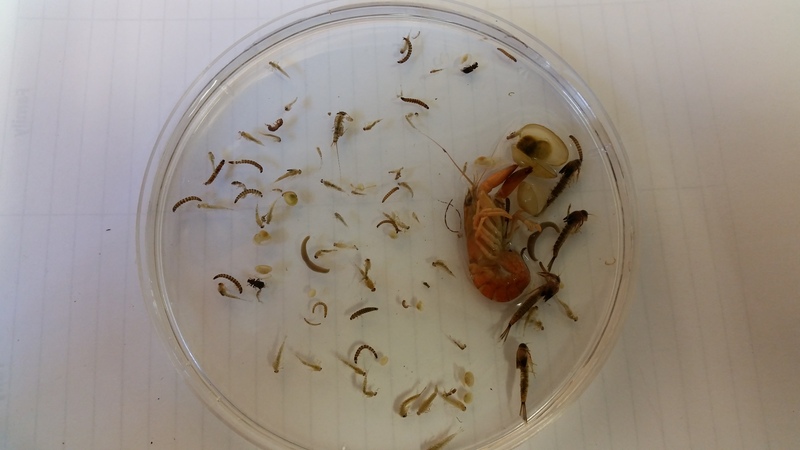 Typical benthic invertebrates are animals such as snails, crayfish, clams, leeches, worms and the larval stages of dragonflies, mayflies, stoneflies and beetles that spend some or all of their lives in water. These organisms provide a good indicator of the quality of the water through the presence or absence of certain groups and species. Some benthic organisms, such as mayflies, stoneflies and caddisflies are very sensitive to pollution. Finding these organisms in our samples is a good indicator of a healthy environment. Some benthic critters are tolerant of pollution , such as worms, leeches and chironomids. Finding these organisms in our samples is a good indication that the environment is being negatively impacted by pollution. Healthy rivers, creeks and streams will also have a large population of benthic macroinvertebrates with high species diversity—meaning that there is a large variety of critters to be found within the bottom muck. Benthic invertebrate samples are collected according to the Ontario Benthos Biomonitoring Network protocol, whereby a “kick and sweep” sample is taken using a D-net across two different riffle transects in a stream segment. Each sample is sorted in the KCCA wet lab and individual specimens are identified to family level. The relative health of the watercourse can be determined from the number and types of organisms found in the samples.